Cold food tables are usually used as Salad Bars, however they may house various types of items that need to be displayed & kept at a low temperature and are designed to maintain and preserve cold food service such as salad bars or other perishables. Cold food tables usually maintain their temperature by using refrigeration, ice or cold-packs meant to go with a certain unit. 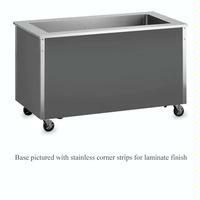 #2 - The unit designed for ice packs are much cheaper then the units designed for refrigeration. The second of the two ways mentioned above were the refrigerated cold tables. These units are designed to be "plug-and-play" - you plug the unit in, turn it on & cold is produced. While this unit is the most convenient in terms of ease... It also more expensive to maintain (more parts, electricity). The main benefit of having a refrigerated unit is simply because you will not have to constantly change the "Ice Packs" mentioned above.